This article is about the town of Satun. For for the Historical Satun Kingdom, see Kingdom of Setul Mambang Segara. Satun (Thai: สตูล, pronounced [sā.tūːn], Malay: Setul) is a town (thesaban mueang) in southern Thailand, capital of the Satun Province. It covers the whole tambon Phiman of Mueang Satun. Satun lies 985 km south of Bangkok. As of 2005 it has a population of 21,498. Satun is connected to Malaysian Langkawi Island by direct ferry service. Satun hosts Thailand's landing points for optical fiber submarine communications cable Segment FEA (FLAG Europe Asia) of the 28,000-kilometer-long FLAG (Fiber-Optic Link Around the Globe); and for the 49,000-kilometer-long SEA-ME-WE 3, which links regions of south-east Asia to regions of the Middle East and Western Europe. ^ "Climatological Data for the Period 1981–2010". Thai Meteorological Department. p. 29. Retrieved 8 August 2016. ^ "ปริมาณการใช้น้ำของพืชอ้างอิงโดยวิธีของ Penman Monteith (Reference Crop Evapotranspiration by Penman Monteith)" (PDF) (in Thai). Office of Water Management and Hydrology, Royal Irrigation Department. p. 125. Retrieved 8 August 2016. 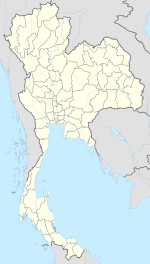 This Satun Province location article is a stub. You can help Wikipedia by expanding it. This page was last edited on 31 January 2019, at 18:42 (UTC).